Craig Statham's 2013 biography of Springsteen's formative years, from his birth in 1949 until Jon Landau's career-changing article in 1974, encompasses unique stories about his family life, early musical successes and struggles, his dedication to attaining his ultimate goal, and his drive towards musical perfection. With in-depth information on each of his bands: The Rogues, The Castiles, Earth, Child, Steel Mill, Friendly Enemies/Dr Zoom and the Sonic Boom, Bruce Springsteen Band and The E Street Band. Saint in the City offers unique insight into Bruce's early life, based on in-depth research and interviews with those who were intimately connected to Springsteen's life and career including early managers, friends and band mates. ...As evidenced by the title, Scottish researcher and author Craig Statham digs into long-ago and formative episodes from the early days of Bruce Springsteen's career, an era frequently glossed over by others authors. Statham allows the story to unfold to a significant degree through extensive and impressive interviews with, among others, Springsteen's early managers, bandmates in barnstorming groups, and residents who knew and grew up alongside Bruce in his hometown of Freehold, NJ. Practice sessions and Freehold-area gigs by Bruce's first band, The Rogues. The account of when someone pulled the plug on The Bruce Springsteen Band at a concert at a marine company. The day a substitute keyboard player took over when Danny Federici took ill before a concert in Richmond. How a soundman called in by Tinker West helped Child develop the sound that set them apart from the rest. 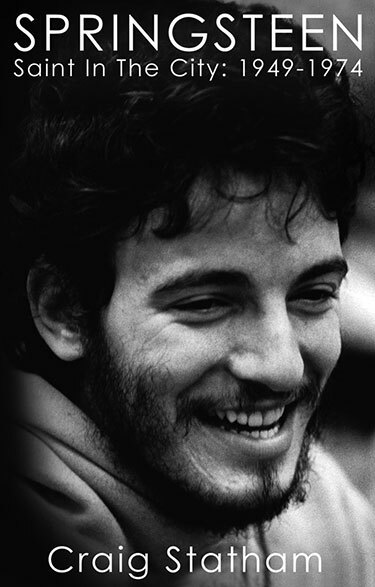 There are stories about an Earth concert in New York, when Bruce began to play "Soul Man" after spotting a large group of black kids in the audience; about a music student yelling at producer Louis Lahav during Greetings recording sessions; new details about the location where the Mike Appel demos were recorded; and insights into the Springsteen songwriting process during the early days from those who were there.